There are many types of materials roofers use. Our roofers have tried and tested almost all roofing materials and found the best solutions for each customer. Black streaks are common on roofing. Architectural shingles have built in algae resistance to keep the black streaks off your roof. They are a cost-effective solution and now come with a life-time warranty. They are energy star approved to keep the temperatures inside your home stable. Our roofing contractors in New Jersey will help you choose from a variety of colors including browns, greys, greens, reds, whites, and black. Architectural shingles are the most modern aesthetic look. ​Asphalt roof shingles come in a variety of styles, the most common of which include: 3-tab shingles, architectural shingles (30and 50-year), and heavyweight shingles. They are created by several different manufactures in a spectrum of colors and with a variety of shapes and weights. By skillfully installing different varieties, NJ Roofing Specialists Company can create a seemingly infinite number of looks. Certain styles of architectural shingles, for instance, can be installed. When installing an asphalt shingle roof system, NJ Roofing Repair Specialists contractors will generally want to strip the existing roof down to the decking and install ice and water shielding material (unless there is already some in place) to preserve the integrity of the roof. There are several types of underlayment which can be used such as Deck Armor underlayment. Shingles are then installed with six nails each. NJ roofing specialists contractors will also want to ensure proper ventilation when installing an asphalt shingle roof system. Ventilation is a key factor impacting the life span of shingle roof systems as it prevents ice dams, condensation, and many other developments, which can cause costly damage. Professional roofers typically create proper roof ventilation by installing vents and using ridge venting material such as Cobra Vent. 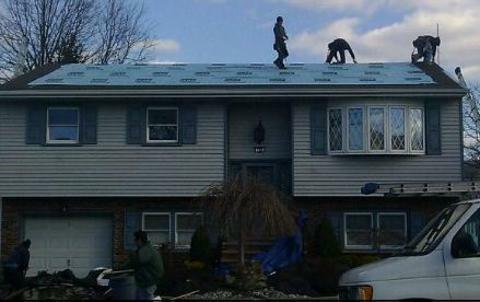 To prevent water penetration, roofing contractors nj will install valley flashings. There are several types of valley flashings. However, they are usually installed with ice and water shield on valley. Side wall flashings using step flashings are also vital to constructing a truly sound roof, as are edge metals (such as drip edge and rake metal) and boot flashings. Chimneys can be counter flashing. Sealants are used where necessary.